Our farm has it’s own holiday. Every year in October, for nine years now, my husband and I can be found at the local grocery store, picking out a handful of bright orange pumpkins. Not that unusual of course – these fabulous gourds can hardly be avoided this time of year. But our chosen pumpkins are not meant for decoration. We’re going to go home, throw them against the ground, and feed them to our goats. Well, that’s a little silly, I’m sure you think. Which of course isn’t a bad thing – it is rather silly. If we want to feed the goats some pumpkin, why not just cut them into chunks? Obviously smashing a pumpkin sounds fun (and it is fun) but we’re supposed to be mature adults – right? The Pumpkin Toss is tradition – one with very humble beginnings. It was quite early in our herd, and there were just a handful of does. Hope, the mother of our herd, and her wether companion Uno. Joining them were Cowbell, a brown doe whose belly hung further than I’ve ever seen, Rudy, a little brown and white doe named for barbeque, and Cowbell’s black and white daughter, who could scream “nooooo!” in a childlike voice. In the pen next door was Buckly, our handsome buck. Like most in the beginning, I was very interested in doing things in a “natural” way. 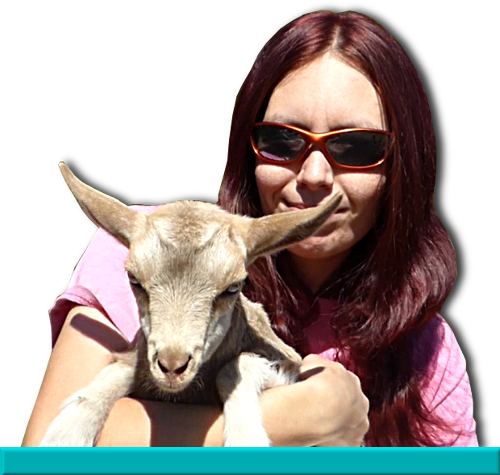 Time would teach me that this often isn’t the best way to walk with goats, but that’s a topic for another blog. Regardless, at the time, I had stumbled upon something I found quite interesting. “We should get some pumpkins for the goats,” I told my husband next time we were at the grocery store. By this point, he’d become brainwashed – I mean, accepting – of this new goat venture, and he paused to consider my words. “I read that the seeds are a natural dewormer, and the flesh is good for digestion,” I’d read it on several websites, so it was surely true. So we did. Arriving home, we shoved the rest of the groceries haphazardly into fridge and cupboard and skipped outside, clutching the pumpkins. We presented them to the does with an air of parental affection, and received puzzled looks in return. Chagrined, we realized our mistake quickly enough. Of course – we needed to open the pumpkins, so they can get at the guts. My husband and I looked at the pumpkins. “Do you want to go get a knife?” I asked. My husband frowned at the idea of walking all the way there and back – unwanted exercise – and shook his head. My husband picked up the first pumpkin, and the goats craned their necks to look up at him curiously. Now, my husband is quite a tall and strong fellow, but even I was impressed at how high he heaved that gourd. It flew clumsily into the air, spinning a bit, then fell down twice as fast, hitting the ground with a hollow thump. It cracked in half, spilling seeds into the grass, and suddenly the goats were much more interested. Delighted as we were with the result, the second pumpkin quickly took a flight as well, splitting into several chunks as it met the ground. The goat herd was truly engaged then, and they dived into the bright flesh of their treats, tearing huge mouthfuls of stringy guts to gulp down. From time to time one paused to hit her neighbor rudely, horns clattering together. Before long they were chewing on the rinds and we deemed the entire affair a success. I know now that the dewormer effects of pumpkin seeds is negligible at best, though the flesh has indeed been useful, though more easily obtained in canned form. But it sure doesn’t stop us from repeated this adventure every single year, some time in late October on a pretty sunny day. I’ll never forget my first buck. Several months after bringing home Hope and Uno, our first two Nigerian Dwarves, I decided that Hope was indeed not pregnant from the buck in her previous home, and I would need to find a new buck to join our little duo. Browsing craigslist rewarded me with an ad for a handsome little black and white buck. The blurb assured that he was a proven breeder, gentle to handle, and even better – he was just fifty dollars. The fact that he was my favorite color sold me, and I excitedly showed my husband, who merely looked resigned at the idea of putting even more goats in the backseat of our car. I had read that bucks in rut would quite smelly, but I neglected to mention such a thing to my dear husband. The seller told me that the buck was in rut and ready to breed, and as we pulled into the parking lot of Petco forty minutes from home, we had no clue what we had signed up for. Truthfully, what I had signed us up for. The seller cheerfully accepted my wrinkled fifty dollar bill and pulled “Buckly” out of her truck by one horn. He looked placidly up at me, his face crusted with yellow stains, and snorted. As my husband came around the car, he stopped dead in horror at the sight of the filthy creature he was expected to lift into the back of our Chevy Malibu. Thank goodness we had leather seats. The buck was unceremoniously shoved through the rear passenger side door, hooves flying as he scrambled in confusion. My husband recoiled in disgust as Buckly turned around and tried to get back out. Instead the goat had the door slammed in his face, and my husband backed away, rubbing his hands on his shorts, obviously rethinking his life choices. I hurriedly thanked the seller, and we left. To the husband’s credit, he did not start complaining until we were once more seated within the car. Both of us looked back at Buckly, who was now standing on the backseat peering curiously out the window. His horns impressively curled around his head, he had a thick long beard, and I was personally very pleased with our purchase. My husband? Not so much. No, no, I assured him. Bucks in rut urinate on themselves and exude a strong musk. It’s normal! I’ll never forget the exasperated look I received, and we drove home in relative silence. Buckly occasionally turned to snuffle at the sides of our heads, which made my eyes water in the most unpleasant way. My husband cracked all the windows, and finally arriving home was an immense relief. I cheerfully popped Buckly into a small pen where he could see his new friends, Hope and Uno, but not reach them just yet. I left them to get introduced, and returned the next morning to find Hope in heat, Buckly eager to escape his pen, and Uno disgusted with the entire situation. Five months later we had the first kids born here at K-N-S Farm. Throughout the week, from Monday to Saturday, I am a very busy person. I am fully responsible for nearly two hundred animals, who need to be fed, watered, and inspected every day at the very least. Twice a day the dairy herd is milked, and you’ll always find me in the parlor in the mornings, and several evenings as well. Hay has to be thrown into feeders – massive amounts of fodder for insatiable ruminants. The dairy and other spaces need to be cleaned, buckets scrubbed, fly traps exchanged. This time of the year, does are found mooning around the buck pen, and need to be caught and sent to a honeymoon suite with a fine looking – and foul smelling – buck. There are ponies that need to be checked on, ensuring that all of them have four feet and a head still. A pack of guardian dogs and collies swarm my legs in greeting at every chance, and their health is just as important. Poultry scatter at my approach, eager for their hen scratch. Even the tiny wild birds, peeping in the trees, are waiting for their share. Even when I’m not with the animals, the work does not end. Breeding and kidding take meticulous planning and forethought. Purchasing and selling rest on my shoulders as well, as well as the extensive social media presence we have built around the dairy. Beyond the dairy are of course my own personal projects, and heaven knows that I have a penchant for starting entirely too many in my eagerness to do everything, be everything, have everything. Not least of all are the hours I spend answering emails, messages, texts. I have always been available to those who are looking for help, if I am capable, and that will not change. Sunday I turn off the phone and I turn on the camera. Sunday, when the gate is opened to release the dairy herd, I am among them. On Sunday, I am little more than a rather peculiar looking goat, and as the herd goes out to browse, so do I.
I wish everyone could experience a Sunday morning the way I do. I listen to the sounds of the goat herd moving among the brush, the birds and wildlife speaking softly to one another, and the only reminder that civilization is waiting for me is the distant drone of the highway. The goats move at a steady pace – they do not stop for long before they are pushing forward, each of them searching out just the right things to eat. They strip branches and vine, grunting and puffing and sometimes shoving one another, and occasionally stop for a scratch from that one odd looking goat with hands. For one morning, I let go of the rest of the world. The frantic freight train of my life pulls into a station for a day of rest. Tomorrow it will be barreling down the tracks at an unstoppable rate once more, but for today, it is still. For a short time, the phone hangs dead at my hip, making no demands for my attention, giving no reminders of all the things yet unfinished. Deadlines and worries are like water that beads up and runs down a mallard’s feathers, and I can breath. For one morning, I am just me. The goats take me to interesting places, and I follow. I know their paths as well as anyone really can, and yet they often show me a new one. Even when we trod the familiar tracks, there is a freshness that only the untamed depths of the forest can bring. A heron startles from the creek and flies overhead. A snake whips through the grass, on the hunt for his own morning meal. A whitetail deer peers at us in suspicion before vanishing into the shadows. We are safe, for the guardian dogs are at every corner, watching, listening, protecting. It’s thrilling, not frightening, to see them lunge through the underbrush at a perceived threat, and both the goats and I trust them. The herd queens watch over their herd as well, and the alarmed snort of a startled goat will bring the dogs at a run. We make a large circle, moving from creekside path to pasture track, and then we are home again. The goats fold their legs and thump to the ground in little groups, eyes closing as they bring up cud, or nap. The silence is broken now by the highway with its semi trucks roaring past, and the phone vibrates, reminding me that I can’t stay out forever. But that’s okay. I return home. I plug back into life as I plug in the camera, downloading the videos and pictures that I have captured, in some small effort to share this day with those who cannot join me. I feel refreshed. I feel alive. The world has reset, and I’m ready to meet the new week once more. 2017 K-N-S Farm Calendars are now available for purchase on the website!